"2011 had quite a few haboobs." That is one reason the new American Lung Association report on air pollution is "misleading", says Bob Huhn, the spokesperson for the Maricopa County Air Quality Department. The ALA's "State of the Air" report gives the Phoenix metro area a failing grade on both ozone pollution and (short term) particulate pollution. And, it ranked Phoenix as the 10th and 12th most polluted in those categories (respectively). However, the grades are based on the 2011-13 years, and that shows spikes in both categories. In fact, looking at the longer-term charts on the Lung Association's page shows a much cleaner picture. The ozone chart shows from 1996 through 2013 (using a rolling 3-year number). The days that Maricopa County has exceeded the ozone limits is way down, even since 2006-08. However, the most recent periods showed an uptick. In announcing the "kick off" of "ozone season" in Maricopa County at the beginning of this month, the Air Quality Department noted that 2014 was a MUCH better year than the previous several, and that "during the last four years, the number of federal ozone health standard exceedances has decreased 39%, from 28 exceedances in 2011 to only 11 exceedances in 2014." Thus, Huhn tells Arizona's Politics, next year will show "significant improvement" in Phoenix's ranking (in that category). Similarly, he says, the particulate ranking will be much better next year. "2011 had quite a few haboobs" (dust storms), and 2014 was much better. Huhn also notes that the Lung Association grades things differently than does the Environmental Protection Agency. The EPA accounts for "exceptional events" that Phoenix cannot control - such as haboobs; the Lung Association does not. The Lung Association's charts below do bear out the timing issue, as well. Maricopa County has seen the particulate exceedances climb dramatically in the last three years, after a long term decline. This inquiry and article were prompted by a misleading tweet and article from a local TV station that flatly declared Phoenix one of the "10 Worst Polluted Cities." The tweet and article not only did not distinguish between ozone, particulates and overall "pollution" - the Lung Association study did not rank cities on the latter - but it neither attempted to look at the details of the ALA's study nor contact the county (or, state) for an explanation or response. To repurpose what ABC15 said (of the pollution): "Not good." Finally, we should also point out that the ALA praised Prescott as THE "cleanest city for year-round particle pollution" AND lauded Flagstaff and Sierra Vista/Douglas as two (of 18) cities to rank on at least two of the three lists (ozone, short-term particulate, annual particulate). Go to Gila River Casinos website and you're greeted with two slides: "Reach New Heights", and "A River of Benefits." Those are especially appropriate if you're Gila Rivers' lobbyists, who were paid an even $1,000,000 in the 1st quarter. Gila River Indian Community's lobbying bill attracted national attention today when Politico noted that the lobbying disclosure statement for the 1st quarter of this year reached "a new record for a lobbying contract that’s well-known on K Street for the hundreds of thousands it brings to Akin Gump every quarter." Akin Gump is a major national lobbying and law firm, and it has represented GRIC on Capitol Hill since at least 2006. Although Politico notes that the amount Akin Gump received from GRIC this past quarter was $980,000, the $20,000 paid by GRIC subsidiary Gila River Telecommunications brings it to seven figures. "Congressional appropriations for irrigation project (BOR), health care facilities construction (IHS) and tribal programs (BIA); monitoring for legislation affecting Native American tribes; tribal tax exempt bonding authority; arbitration legislation; lease review authority legislation; land purchase valuation legislation; law enforcement issues; trust claim settlement; restrictions on off-reservation gaming; environmental restrictions on Navajo Generation station; H.R. 308/S. 152; negotiation of congressional settlement of tribal trust accounting claim and drafting legislation." Of course, the smallest reference - to "H.R. 308/S.152" - is probably what generated the largest portion of those lobbying fees. Those are the bills from Sen. John McCain (R-AZ) and Rep. Trent Franks (R-CD2) opposing the casino being built by the Tohono O'odham in Glendale. Despite Akin Gump's best efforts to push the measure, both bills are languishing in their respective chambers. For point of comparison, the Tohono O'odham split $410,000 among four lobbying firms in the same period. The Russians are leaving! By the end of June, Russia's ownership of Arizona uranium mining rights should be sold. The article details how the Clinton Foundation received millions of dollars from Canadian mining financiers as they were selling a majority interest of their U.S. uranium mining interests to the Russians. The sale thus required approvals from multiple agencies in the federal government, at a time when Hillary Clinton was the Secretary of State. According to Arizona State Geologist Lee Allison, the mine is eventually expected to produce about 550 tons of uranium oxide. It would be located on state trust lands, just outside the Hualapai Tribe's lands, and the high grade of the uranium there has been touted by the owners. It appears that if the deal is completed, Russian-owned Uranium One will only have one uranium mining asset left in the United States, in Wyoming. ** Vane Minerals announced in January that it was selling its interest in the Wate Pipe mine to publicly-traded Energy Fuels Inc.
As noted in our previous article, McSally had $266,000 net cash on hand on December 31, 2014, while the Representative she narrowly defeated, Ron Barber, showed a net campaign chest of $383,000. The strong reported showing comes one day before Barber is scheduled to appear on the Zona Politics TV program to announce whether he will seek to regain his Congressional seat. The actual report is due on April 15. For comparison purposes, Barber raised half that amount ($297,213) in the first quarter of his (only full) term in Congress, and McSally outraised him in nearly every quarter of their 2014 rematch. * On December 31, 2014, her cash on hand was reduced by $98,500 in outstanding debts/loans; until the official report is filed, we will not know whether the $800,000+ is net of that $98,500, or if they are still outstanding. Will There Be Round 3? Fmr. 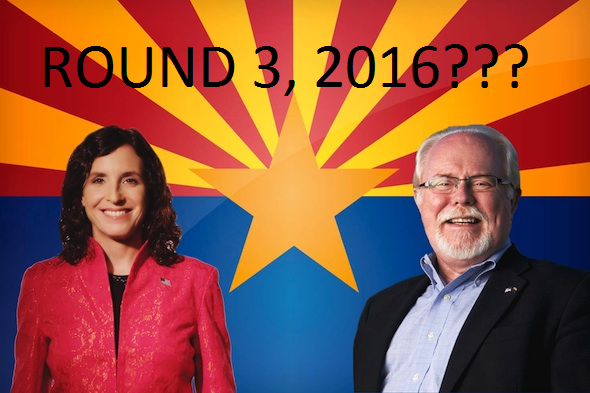 Rep. Ron Barber Makes Announcement Sunday Morning; McSally Participates In GOP Establishment's "Patriot Day I (2015)"
Will there be a third classic battle between current Rep. Martha McSally (R-CD2) and Ron Barber (Dem. ), the Representative she defeated last year on her second try? Barber, 69, is announcing his decision tomorrow, on (the similarly-named) Zona Politics program on Channel 9. Echoing the two hard-fought campaigns between Jim McNulty and Jim Kolbe 30 years earlier, Barber and McSally battled to near-draws in 2012 and 2014. In the former, Barber was aided by the Democrat at the top of the ticket, and in the latter, McSally received a boost from the national trend. Interestingly, while the vanquished Congressman was consistently outraised and outspent by McSally, Barber had more net campaign cash on hand at the end of 2014. Barber and McSally have to file reports later this week, but the 2014 year-end reports show Barber with net cash on hand of $383,000 and McSally with $266,000. Meanwhile, McSally's campaign fundraising is already gearing up for a re-election campaign. She recently added a new Joint Fundraising Committee to her long list of group fundraisers. "Patriots Day I 2015" is the newest effort. It will benefit 10 1st and 2nd term Republican Representatives from around the country. The NRSC has doubled down on its Twitter campaign to spread blatant lies about the Obama Administrations actions towards Israel. NRSC Chair Sen. Roger Wicker (R-MS) and Arizona's two U.S. Senators - John McCain and Jeff Flake - have remained silent after the falsehoods were brought to their attention. After a full week of more than twice-daily tweets blasting the President for "leaking" a "classified memo on Israel's nuclear program", the NRSC latched on to an opinion piece on TheHill.com claiming that the release "breached (an)...agreement" between the nations. None of these allegations are correct. Even after Arizona's Politics emailed the spokesmen for the three Senators with evidence of what really happened, the NRSC continued to repeat the false tweets. After an opinion piece on The Hill today, the NRSC revised its "article" to include the new falsehood. Senators McCain, Flake and Wicker remained quiet. The story began in earnest last month, in a lawsuit against the U.S. government seeking information about how Israel may have taken nuclear material from the U.S in the 1960's. The group specifically sought a 1987 UNCLASSIFIED assessment about the status of nuclear technology in Israel and NATO nations. On March 25, immediately after the conservative Israel National News reported that the U.S. had "declassified" and "published" the report, conservative powerhouse Breitbart exaggerated it by claiming in its headline and lead sentence that the report had been "TOP-SECRET". It also embellished by (falsely) claiming the assessment's sections on NATO countries was "kept...classified." The NRSC used the Breitbart article as the foundation for its own article the next day - adding the opinion that it was part of retaliation for Israelie Prime Minister Netanyahu speaking to the U.S. Congress, and immediately began tweeting inflammatory headlines like "Inexcusable: Obama Administration leaks classified memo on Israel's nuclear program." Between the 26th and 28th, the NRSC sent out eight such tweets to its 64,700 followers. On the 28th, the Jerusalem Post delivered what should have been the final nail in the Breitbart/NRSC's story: the Obama Administration had notified Israel of the FOIA request and had asked for its input. The Israeli goverrnment did not object to releasing the unclassified assessment. The false report continues to be tweeted out twice per day. Today, Herbert London published an opinion piece on TheHill.com, reiterating most of the initial Breitbart inaccuracies and focusing on the fact that it "breached" an agreement between the U.S. and Israel. The NRSC re-wrote its article and held out the column as a factual "report", and adjusted its tweets accordingly. "Inexcusable: Obama Admin. breaks agreement, leaks classified memo on Israel's nuclear program." The NRSC raises mightily from the Republican Senators, and is a quasi-official organization for them and by them. It is far different for the NRSC to parrot knowingly-false attacks than for a talk show host or Breitbart to do so. Senators have the power to remove and/or correct the falsehoods, and to take the tweets out of the "heavy rotation"; not doing so gives the attacks on the U.S.-Israel relationship their imprimatur.